Beneficiaries enjoying snacks provided by one of our sponsors- Blue Skies. The dream team. #TeamSickleLife. Join us. Hello everyone, it’s been quite an interesting week in Ghana. Congratulations to Ghanaians for generally peaceful elections and the ongoing transition process. We at Sickle Life are earnestly looking forward to 2017 with all the opportunities it holds. First however, we need to address the elephant in the room, The 2016 World Sickle Cell Day Report. Putting it simply, our website was well, “compromised” in the immediate post World Sickle Cell Day period which left us without our primary output medium for a couple of months. We however maintained posts via Facebook- Sickle Life and Twitter/ Instagram- @Sickle_Life and subsequently created a gallery for the event on our new and improved website when we got it running. (Please check out the event gallery or our instagram page for more pictures on this event). Our IT team has worked tirelessly to restore all the original content, which was no mean feat considering the extent of loss. We are extremely grateful to our volunteers whose tireless efforts keep us operational as well as our sponsors and partners for your patience while we rectified issues. We are indeed sorry for the delay. Members of the general public who obtain information via this website and send us private questions, thank you very much, keep them coming. This event was only the first of many planned by Sickle Life and this report highlights the achievements and lessons with the aim of better equipping us for subsequent projects. Kindly provide feedback in the comments section on your experience of the event and expectations for subsequent projects. Thank you very much. 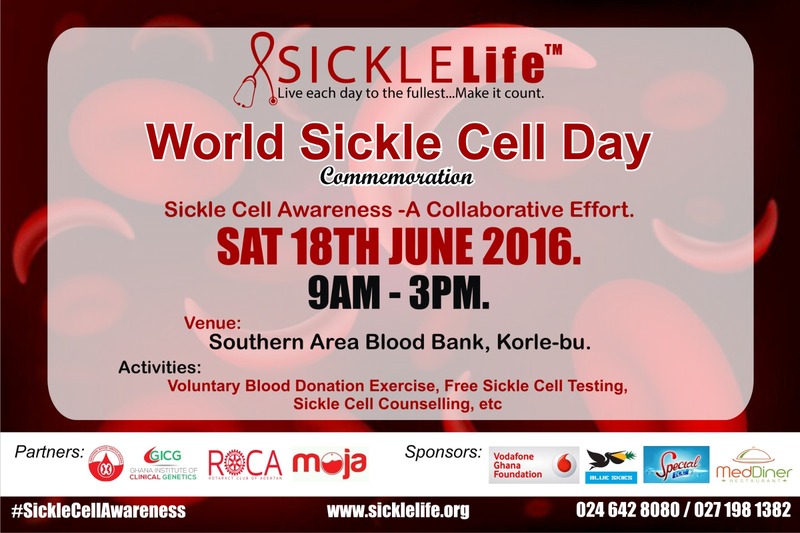 REPORT ON SICKLE LIFE 2016 WORLD SICKLE CELL DAY COMMEMORATION HELD ON SATURDAY JUNE 18th 2016 AT THE SOUTHERN AREA BLOOD CENTRE, KORLE- BU, ACCRA. Globally World Sickle Cell Day is commemorated on the 19th of June every year, a day set aside by the United Nations (UN) to raise awareness on Sickle Cell Disease. These commemorations as stated in the UN resolution on Sickle Cell Disease are in recognition of the fact that Sickle Cell Disease affects over a hundred million people globally and is often fatal when not managed early. Commemorations since the inception of World Sickle Cell Day have been on themes such as “Recognition of Sickle Cell Anaemia as a public health problem” in 2008, “Break the Silence on Sickle Cell Disorder” in 2014 and in 2016, “Exhibit courage and address ineffective areas of support”. These themes tackle important issues in the Sickle Cell Community with commemorations varying from social media campaigns to free genotype testing and counseling organized by a variety of organizations nationally and internationally. 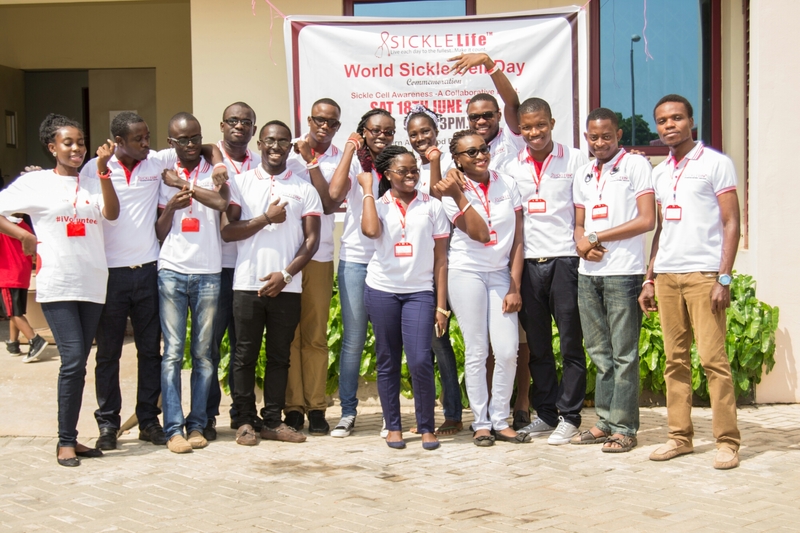 The 2016 World Sickle Cell Day Commemoration organized by Sickle Life was the first of its kind by such an organization in Ghana. This event brought together several individuals and organizations with an interest in Sickle Cell Disease to work together to increase awareness about the condition. The theme, Sickle Cell Awareness- A Collaborative Effort, was inline with the 2016 global theme which sought to encourage people to exhibit courage regarding Sickle Cell Disease and address ineffective areas of support for the condition. It was quite sad to note that in Ghana, there was no major National Commemoration of World Sickle Cell Day. Several programmes were however organized by a number of individuals and organizations actively involved in the Sickle Cell Awareness creation efforts. Many of whom are in one way or the other directly affected by the condition. Our individual efforts though laudable could yield greater results if we work together toward our common goal. 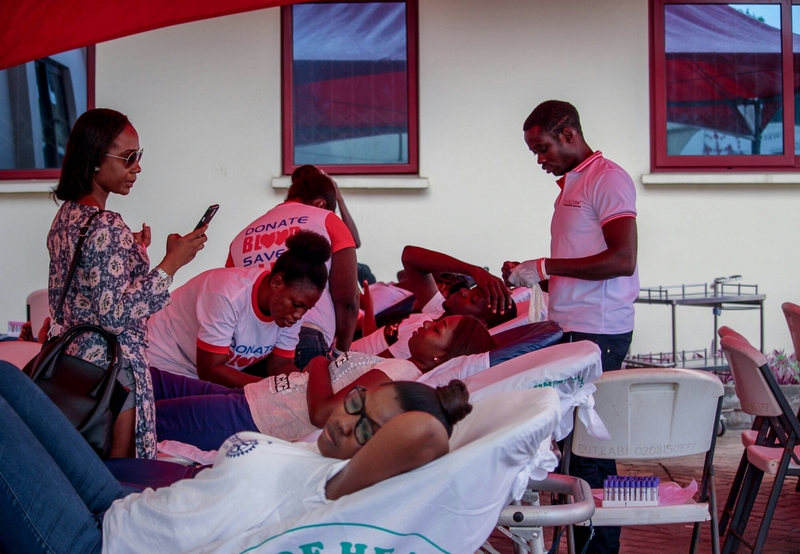 For our part, Sickle Life organized a blood donation exercise, Free Genotype Testing and Counseling in collaboration with the Vodafone Ghana Foundation, National Blood Service, Ghana and the Ghana Institute of Clinical Genetics, Korle-Bu. It was heart-warming to see several persons living with Sickle Cell disease attend this event. The patients wanted to be heard and we provided an opportunity for them to do just that. Also in attendance were doctors from the department of haematology, Korle-Bu Teaching Hospital, staff of the Ghana Institute of Clinical Genetics, Korlebu (Sickle Cell Clinic), Members and Executives of the Ghana Sickle Cell Association, representatives of our sponsors and partners and a large number of persons who are affected by Sickle Cell Disease in one way or the other and are willing to work to improve the lives of persons living with the condition in Ghana. This event was truly representative as speeches and contributions made by medical personnel, patients, representatives from our sponsors etc. reiterated the many challenges in the care and management of Sickle Cell Disease in Ghana and the reality of living with this condition, given the constraints of our health care system. Among the speakers were Dr. Olayemi, Head of Department of Haematology, Korle-Bu Teaching Hospital, who emphasized the importance of creating awareness about Sickle Cell Disease and preventing the condition. Dr. Eugene Tettey of the department of Haematology spoke on the importance of blood transfusions in the management of Sickle Cell Disease while Dr. Sefakor Enam Bankas, Founder of Sickle Life spoke about Sickle Life, it’s mission, vision, projects and role in the fight against Sickle Cell Disease in Ghana. Mr Joel Addai, the Public Relations Officer of The Ghana Sickle Cell Association emphasized the need for Government to support Persons living with Sickle Cell Disease in Ghana and Dr. Anthony Anemana, a person living with Sickle Cell Disease, and Sickle Life volunteer, spoke about living with Sickle Cell Disease and how to cope with the condition. Mr. Michael Torgbui a person living with Sickle Cell Disease also shared his experiences. These talks were truly inspirational and served as a nidus upon which a lot more work on Sickle Cell Disease can be undertaken. Representatives from Vodafone Ghana and the Vodafone Ghana Foundation, Mr. Jonas Aryeh and Mr. Daniel Kissi Asiedu spoke about Vodafone Ghana/ Vodafone Ghana Foundation’s interest in supporting Sickle Cell Awareness related projects and their interest in supporting Sickle Life on its project. Other speakers on the day were representatives from Moja, the Rotaract Club of Osu RE, the National Blood Service, Ghana etc. In total about 250 people were in attendance at this event. 51 units of blood were donated and 119 people benefited from the free sickle cell and blood group testing. Of the people tested, 71.4% were AA, 11.8% AS, 11.8 AC, 2.5% SC, 1.7 AF and 0.8% with an unknown electrophoresis band detected. The wide variety of electrophoresis results obtained further emphasize the importance of sickle cell genotype testing beyond sickling testing and more than that, the importance of having well trained medical personnel to undertake testing, counsel beneficiaries and offer further testing based on results obtained as was the case during event. Staff of the Ghana Institute of Clinical Genetics joined Sickle Life to offer pre-test counseling and have been available for post testing counseling for beneficiaries as well as registration of newly diagnosed patients for expert clinical care. We are pleased to announce that we rolled out a new text based result delivery system, managed by our volunteers to provide initial lab results via text messages and subsequently have informed beneficiaries to pick up their test results from our volunteers in Korle-Bu. After this, necessary counseling will be provided and where necessary referral to the Sickle Cell Clinic for further counseling and care provided. All beneficiaries who are yet to pick up their test results should kindly contact us to pick them up. Further, voluntary blood donors may also pick up their blood donor cards” from the National Blood Service, Korlebu. All donors should please note that you can donate blood at 4-months intervals. We encourage as many people as possible to commit to becoming voluntary blood donors. Beyond providing a life saving service, being a voluntary blood donor ensures you and your relations have access to blood when required. We’ll communicate any subsequent programmes to you as these may serve as collection points for both blood test results and voluntary blood donor cards. 1. The duration of our World Sickle Cell Day commemoration was quite short. 6 hours did not provide adequate time to test as many people as projected and also greatly limited the units of blood collected as several people turned up later in the day. Hopefully in subsequent events we can organize a full day programme or extend the activities over several days to ensure all targets are met. 2. Contrary to expectations, few organized groups joined us on this campaign. This could be attributed to the fact that many tertiary institutions were on vacation during the period. This in our opinion, greatly limited the number of units of blood collected. It is our hope that in subsequent events more organized groups will partner with us, especially regarding blood donation. We are however grateful to groups such as Rotaract who mobilized their members from several clubs to join us for the event. 3. In addition to lack of organized group, it was observed that the turn out may have been affected by the location of the event as well as lack of an organized means of transportation. In subsequent events we’ll work to use a more central location and possibly provide a means of transportation if we are able to raise adequate funds. 4. Activities on the day were centered on talks, testing, counseling and blood donation. Beyond these there were fun activities such as games, music, photo shoot and a food shed for relaxation. However these activities may not have been engaging enough as many of the people in attendance did not have activities to engage in beyond these. The hope is that in subsequent events we’ll have more activities to attract people to the venue and keep them engaged longer. 5. Majority of the people present were interested in the Free Sickle Cell testing as opposed to the blood donation which resulted in the team testing twice as many people as those who donated blood. Though both aspects are separately important, it’s our hope that in subsequent events we can encourage more people to donate blood to support persons living with Sickle Cell Disease. 6. Post event results delivery and coordination were quite slow. Many lessons were learnt from these event and we hope to improve the efficiency of our result delivery system in subsequent events. 7. Raising awareness for health topics such as Sickle Cell Disease is quite difficult. The benevolence of the Vodafone Ghana Foundation was instrumental in the publicity creation effort. We are eternally grateful to the Vodafone Ghana Foundation and the various media organizations such as TV3, ETV, Happy FM, Class FM, Joy FM, MultiTV etc. and individuals who helped publicize this event via social media before, during and after June 19th. 8. The most important step in our awareness creation effort is collaboration. It was heart warming to find many Sickle Cell Disease related organizations represented at this event. We hope to collaborate a lot more with other health related organizations and call on such organizations to collaborate more for better effectiveness. 9. Raising funds toward this project was quite difficult. It was especially challenging planning in advance without funds. Thankfully we obtained adequate funds and support in kind in good time to organise a successful programme. It’s our hope that for subsequent programmes we’ll be able to raise even more funds a lot earlier toward specific items such as free Hb electophoresis tests, medical equipment, consumables and medication for health screening programmes, hospital donations and to support the many persons living with Sickle Cell Disease who call us from time to time for assistance. We accept donations all year round through our MTN Mobile Money account 0246428080 and our Fidelity Bank Account: Sickle Life Account Number: 1050625434128. Kindly support us make a change in the health landscape of Ghana. 10. The hardwork and commitment of our volunteers from diverse fields was instrumental to the success of this event. We aim to do a lot more in the coming years and we’ll need a lot more volunteers to achieve all our aims. Volunteer with Sickle Life today by filling this volunteer application form. Sickle Life is eternally grateful to all sponsors, partners and supporters who assisted us in commemorating World Sickle Cell Day. We are very grateful to individuals who contributed various sums toward this programme as well as everyone who purchased wristbands in support of our project. 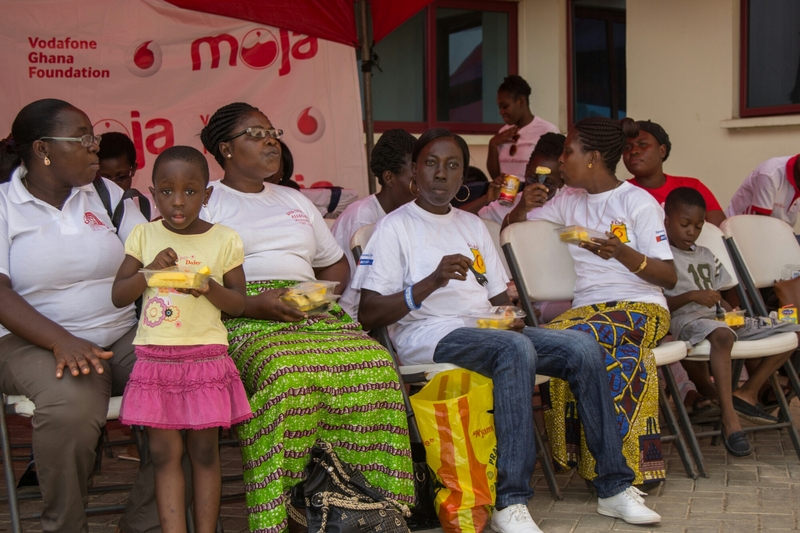 We’d like to again commend our sponsors, partners and supporters for demonstrating so much faith in us and collaborating to raise Sickle Cell Awareness in Ghana. Ghana Institute of Clinical Genetics, Korle-Bu. This entry was posted in Blog, News/media and tagged Ghana, health, sickle cell awareness, sickle cell disease, Sickle Life, Vodafone Ghana, volunteer, World Sickle Cell Day. Bookmark the permalink. ← Team Care Slashes Deaths From Pregnancy In Sickle Cell Anemia in Ghana.